A vegetarian for twenty years I'm here to share my love of all things meat free! 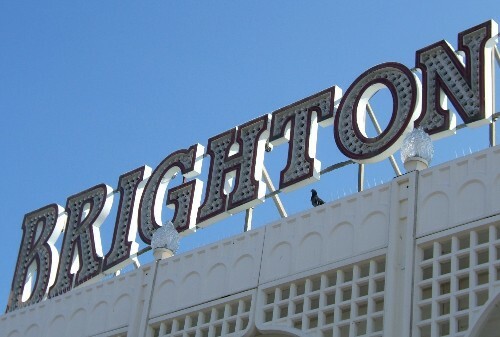 Is Brighton & Hove the best place to be a vegetarian? Quite possibly, and luckily for me I live here! Brighton has always been a very tolerant, liberal kind of city and this alternative culture has spawned a large vegetarian community which I’m proud to be a part of. There are loads of places worth checking out if you’re vegetarian and want to explore Brighton. Terre a Terre is a mainstay of veggie dining in Brighton and is often voted one of the best vegetarian restaurants to eat at in the UK. It has recently undergone a renovation and looks even better than ever. The staff are always very welcoming and knowledgeable about the dishes on offer. Some of the ingredients can be a bit baffling, but staff are always on hand to explain. Prices are on the £££ side but believe me, it’s well worth it, especially if you are celebrating something like a birthday or anniversary. You won’t regret going! Wai Kiki Moo Kau has been around for what seems like years and has always been a reliable veggie place to eat in Brighton. Located in the North Laines, it’s a great choice if you’re browsing the Brighton Laines and are looking for somewhere to go for lunch. Lots of healthy options, including some great freshly squeezed juices, they also do a great mezze platter for two. Prices are ££. Iydea has been around for a couple of years and is on the same street in the Brighton North Laines, on Kensington Gardens. I love it, and is another great choice for a quick lunch.Food is served buffet style and you can eat in, though space is limited and you may have to share a table. Prices are £. Update! A new branch of Iydea has now opened on the Brighton/Hove border on Western road, near the junction of Montpelier Road, so why not check it out! Ethels cafe in Hove is not strictly vegetarian but has some great veggie options. Located on Blatchington Road, it offers a great breakfast and lunch. Staff are always friendly and there are tables out front if the weather is nice. Food is always very fresh and pretty healthy. Prices are ££. Open daytime only. The great thing about looking for veggie food in Brighton is that virtually everywhere has a great choice of veggie options, so you don’t necessarily have to seek out a specifically vegetarian restaurant (though I would recommend you do if you can!). So if you are looking for a great veggie culinary experience, you couldn’t do better than coming to vegetarian central – Brighton & Hove! Vegetarian New Year Resolutions – five reasons to stick with it!